Dr. Ron Mallett is a celebrated theoretical physicist at the University of Connecticut, but he was once a little boy with a copy of “The Time Machine” by H.G. Wells. Mallett’s father died when Mallett was 10 years old, and when he read this book a year later the idea of traveling back in time to prevent his father’s death gripped his imagination. “I used black holes as a cover story,” he said with a laugh. Albert Einstein described time as a 4th dimension and he said that time and space are connected, thus physicists talk of space-time. It is said that space-time bends and twists around rotating black holes. Mallett wondered if he could replicate these conditions here on Earth. A couple of coincidences helped him figure out how. When he graduated college, he wanted to start his research right away, but it was a time of recession and colleges weren’t readily hiring. He ended up working with lasers, learning about their cutting capabilities for industrial use. After two years of this work, he got the job he originally wanted at the University of Connecticut. 1. According to Einstein’s Special Relativity Theory, time is affected by speed. It’s already been proven in the lab that subatomic particles can be hurled into the future at high speeds. An accelerator has been used on particles known to disintegrate after a certain amount of time. The particles appear in the future, in a young state, without having disintegrated over the usual time period. The particles’ aging slows down as they speed up. 2. According to Einstein’s General Relativity Theory, time is also affected by gravity. It’s already been proven that clocks on satellites in orbit show a slight difference in time than clocks on Earth if they aren’t adjusted to compensate. Dr. Mallett knew that gravity could affect time, and that light could create gravity. He pondered and pondered, and then his “Eureka” moment hit. Lasers! He remembered from his earlier work with lasers that a ring laser creates circulating light. “Maybe circulating light will do the same thing to gravity that a rotating black hole would do,” he thought. He wondered if a ring laser could be used to twist space-time into a loop—present, future, and back to the past. If the laser could create such a loop, information could be sent to the past in binary form. Neutrons spin, Mallet explained. A string of neutrons could be arranged so that some are up and some are down, representing 1s and 0s respectively, thus creating a binary message. If Dr. Mallett had found the research job he wanted right out of college, he wouldn’t have worked with lasers and gained this knowledge that helped him so many years later. “I had something in my background that my colleagues who work in this area didn’t, so it was having that in my background that led me to that breakthrough, which I may not otherwise have had,” Dr. Mallett said. Now for the hard part—testing this theory in mathematical equations. That’s where the second coincidence came in. Dr. Mallett was diagnosed with a heart condition shortly before he was struck with his inspiration to use ring lasers for time travel. He was on medical leave from many of his duties at work. Without having to teach classes or perform committee duties, he was free to concentrate wholeheartedly on his research. “If I hadn’t had that time, I don’t know if I would have been able to not only have the breakthrough, but also the time to work it out,” he said. It took him six months to prove that circulating light could twist space. It took another couple of years to prove that the twisting of space could also twist time. Though it was a long, laborious effort, Dr. Mallett noted that it took Einstein 10 years to show that gravity affects time. “It was worth it … to actually see the equations and to see that they predict that [time travel is possible] is a thrilling thing,” Dr. Mallett said.The next thrill came when a refereed journal published his first article on time travel. 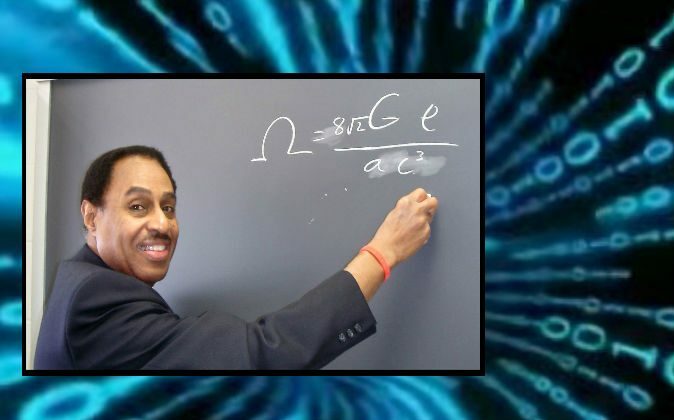 With trepidation, he presented his findings to relativity experts at a conference held by The International Society on General Relativity and Gravitation. He was particularly nervous to talk about time travel in front of Dr. Bryce DeWitt, a prominent no-nonsense physicist who worked with Einstein. Dr. DeWitt spoke right before Dr. Mallett, a tough act to follow. In one short sentence, years of labor were validated, his aspirations realized, and his initial purpose fulfilled. Though he’d dreamt as a child of preventing his father’s death, he feels the discoveries he’s made, motivated by his father’s memory, are more than sufficient. His father was the object of great love and admiration in the young Dr. Mallett’s life. His mother worked hard to support Mallett and his three siblings in the Bronx borough of New York City. It wasn’t easy especially in the 1950s as an African American woman to earn a living and the family fell into poverty. He realizes how hard it must have been for her, only 30 years old at the time, to lose her husband to a heart attack so young and to work to raise her children. How Long Will It Take to Make a Time Machine? We must make it clear that Dr. Ron Mallett is not tinkering in his garage with a Delorean and a flux capacitor like Doc Brown in “Back to the Future.” He’s a theoretical physicist, not an experimental physicist. That means he’s developed the mathematical evidence that time travel to the future should work, but it remains to experimental physicists to get the hardware and build the time machine. That could cost some $250,000 just to get started, he said. The $250,000 would cover the feasibility study, and the feasibility study would determine how much the experimental phase would cost. Donations are being made to the University of Connecticut Foundation. “Over time nearly $11,000 in funding has been received from a great many generous contributors ranging from $15 to $25 from enthusiastic middle school and high school students to $500 from a concerned young couple to $1,000 from a grieving parent,” Dr. Mallett said. He expects that once the feasibility study starts, the whole process would take about five years. If one day a time machine is built based on Dr. Mallett’s design, what may happen when the switch is flipped? A message from the future could instantly appear. The time machine would only be able to send information along the timeline from when the machine is first turned on until when it is turned off. So, if it stays on for 100 years, binary messages could be sent to any time within those 100 years. Someone from the future may know that the machine will be activated on a given date and send a message through to that time. If we could go back in time and fix all the suffering of the world, if we could go back and prevent the bad things that happen in our lives, what would that do for personal growth and wisdom? How would our society change? Dr. Mallett said the movie “Time Cop,” starring Jean-Claude Van Damme, explored this idea well. Van Damme’s character was tasked with regulating time travel so that people couldn’t use it for their own purposes. His wife had died and he had to restrain himself from going back to save her. “It’s up to society to decide how time travel is used, it’s not up to an individual,” Dr. Mallett said. The Large Hadron Collider, the world’s largest and most powerful particle accelerator, is run by a consortium of nations. He imagines a time machine would be controlled in a similar manner. He doesn’t imagine time machines will become any more common than nuclear reactors. People won’t have time machines in their backyards for casual use. For Dr. Mallett, the best use of time travel would be to warn people of natural disasters—to prevent, for example, the thousands of deaths caused by tsunamis and hurricanes. At the Follow the Truth: The Conspiracy Show Summit in Oshawa, Ontario, Canada, on Nov. 16, Dr. Ron Mallett will talk about his work on sending information into the past. The summit will bring together researchers exploring the power of the mind, past lives, time travel, and more. What Is Time? What Would the World Be Like Without It?